Since I began this blog, MaryRefugeOfHolyLove, in April 2015, I have built up quite a few resources and hyperlinks to help people who are searching for answers in their life journey. Primarily, for those who are seeking God and wondering if He really exists. For a few years of my life, I used to be an atheist. I became an atheist in junior high school when I was exposed to the theory of evolution and due to lack of education in Catholicism–the faith that I was baptized into as an infant–I fell away very easily. However, being an atheist made me very depressed. Why? Because at the end of the existential road is nihilism and accepting that life is meaningless and pointless made me harbor suicidal thoughts. Really, it got quite hard to get out of the bed each morning and to desire to do anything productive, like attend college, have a career, marry, raise a family, etc. So, one day, when I was 17 years old, I literally said to myself, either I believe there is a God, or I kill myself because there is no purpose for my existence. I had no joy in my life and always being a deep thinker my whole life, thinking that there was no purpose for my existence was that troubling for me. So, then I told myself that I am going to start believing in God, because I have to believe that there is some purpose in my life, otherwise, I cannot exist anymore. I told myself that if there is a God, then I have to believe that He would not hide Himself from us, because I cannot accept that He would create us and then simply disappear without telling us about Himself. So, I said to myself, one of the religions in the world must be real, but if I do not find out which one, I will become Catholic by the age of 25 for lack of anything better. Because my parents are Catholic and they are happy together and I just want to be happy in life again. And so, that began the great searching period in my life for God. I dappled in Eastern religions and New Age for awhile, but I was never quite satisfied with the logical foundations of these various religions. Then, as people who have read my conversion story know, in 2001, I broke my leg and during surgery, I encountered God in what was very similar to a near-death experience, etc. Now, that supernatural experience should have brought me home immediately to the Catholic Church, but due to various circumstances, it was not until late December 2002, that I discovered the Catholic faith of my infant baptism. I was 3 months shy of my 25th birthday, because–surprise, surprise–God remembers promises like the one I made to myself at age 17. 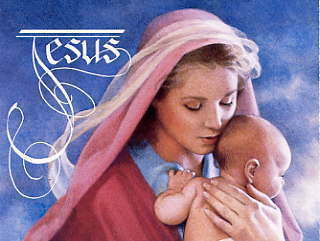 And yes, like so many Catholic conversion stories, it was the Blessed Mother who ultimately brought me back to the Catholic Church and I found Jesus. I am so eternally grateful. And so, I know what it is like to be an atheist, an agnostic, and to be searching for God. So, in this blog post, I want to provide help for those who are struggling with those questions in their life, as well as help lukewarm Catholics. For me, I literally “read” myself back into Christianity. So, I want to share the books that helped me to understand Christianity, and in particular, Catholicism. These are good, hearty, well-researched, easy to read books–not some “fluffy” stuff that people make up a lot on the internet to support their arguments. The reason that I recommend these three books is because even if you want to remain an atheist, it is important that you know about what Christianity really teaches and not by reading all the “fluff” that can exist on the internet. At least be informed about what you are truly rejecting. 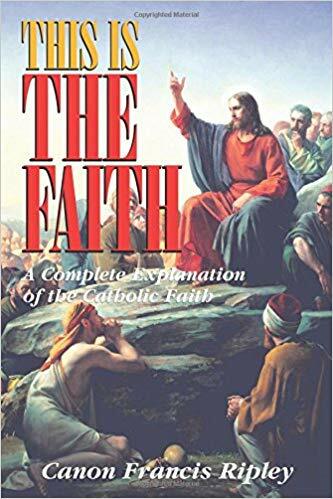 “This is the Faith” is the finest book that I know that teaches about the beliefs of Catholicism. 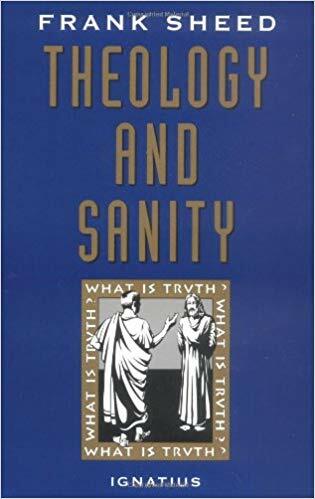 “Theology and Sanity” is the finest book that I know to teach a layman the beauty, the logic and rationale behind Christianity. The Christian God is one of logic, order, and reason. 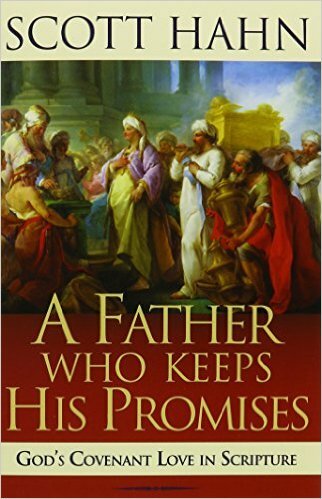 And “A Father Who Keeps His Promises” is the finest book I know on how to read the Holy Bible. It was not until I read that book that I finally figured out how the Old and New Testaments are reconciled together. Now, after reading those books, if you want to get serious about understanding Catholicism and science, then I recommend the three books on this blog page. The first book is about evolution and the Great Flood; the second book is about how rare life is in the universe by two agnostic scientists; and the third is the Catholic theology for the existence of extraterrestrials (aliens). Reading about miracles excites people in their faith. Knowing that God continues to help people even today, is exciting to know. Seriously, if priests were to read these books and just for one year, preach about one miracle at every Sunday Mass, how many people would become animated each week. 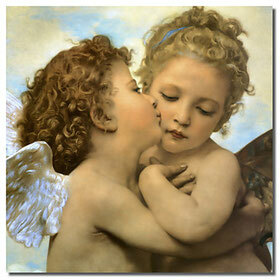 People would joyfully wonder to themselves, hmm, I wonder what miracle story dear Father is going to share with us today! Such stories stick in the minds of people and demonstrate God’s Great Love for us and the power of prayer. Today, people feel no need to pray because they think that God does not listen to them and nothing will happen. But, if people knew that God really cares about them and He is simply waiting for them to ask Him and share their needs in prayer, this would make a noticeable change in the life of many parishes. I want to offer a challenge to my Catholic readers. Firstly, read all the miracle books on the list that I provided, then give the books to your parish priest and ask him to preach on a miracle at every Holy Mass for a year. That way, people can learn of God’s Love and care for them and the necessity of prayer to God. For example, many people know that St. Patrick was a great saint of Ireland, but not many know why. It was because St. Patrick performed a resurrection miracle by the power of God. St. Patrick resurrected the drowned daughter and son of the pagan king, which then led to the entire pagan island converting to Catholicism. One of the books that I recommend recounts 400 resurrection miracles performed by the Saints. Priests could simply preach on the power of the Resurrection for a year and that would animate many people in the pews. Now, let’s say that you are an atheist and you do not believe in miracles. Well, I am going to present to you in the remainder of this blog post, several miracles that are hard for an atheist to refute if he really delves into researching the history of them. Here are the miracles for you to consider. Firstly, there are over 200 bodies of different Saints in the Catholic Church that are incorruptible. Incorruptible means that they have not decayed from natural causes. On this blog page, are the “Top Ten” of such miracles of the Saints in the Catholic Church, which includes pretty good photos. One Saint is Blessed Imelda Lambertini, who died in 1333, and I would say that her body is remarkably preserved for being almost 700 years old! Another is Saint Silvan who died circa 350 and he looks great for being over 1600 years old! Also, here is the blog post that I made for Pope John Paul II. He died on April 2, 2005 and when his body was exhumed in late April 2011 for his canonization, he was found incorruptible! Finally, here is an outside link that has extensive information on the miracle of incorruptibility uniquely found only in the Catholic Church along with photos. Alright, perhaps, the incorruptible bodies are not enough to sway you on the Catholic faith. 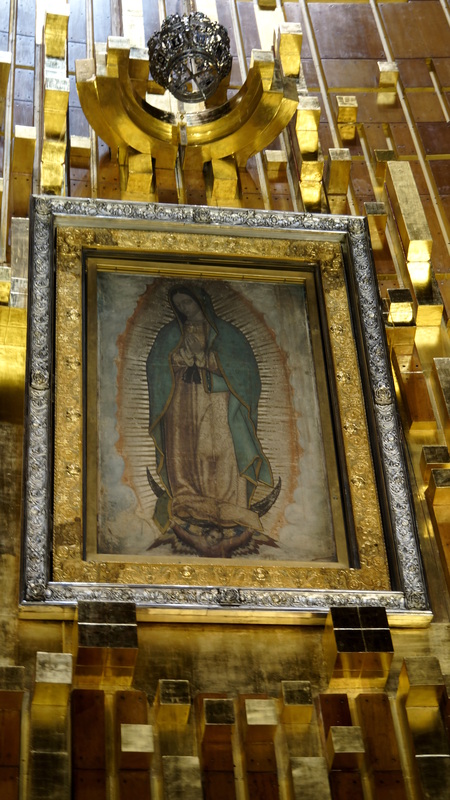 Well, how about the tilma of Our Lady of Guadalupe? The miraculous Image of the Blessed Virgin Mary was imprinted on a poor-quality cactus-cloth that should have deteriorated after 20 years. But, the cloth is almost 500 years old! Now, maybe you are still not convinced. Well, how about the many miraculous events contributed to Our Lady of Fatima? Firstly, the Blessed Virgin Mary appeared to three shepherd children in Fatima, Portugal, in 1917, and gave several important prophecies. She accurately predicted that Russia would be in the ascendancy and would spread its errors around the world. This was 6 months BEFORE the Bolshevik revolution. At the time, Russia was under the reign of the czar and many of its people–peasants were starving, etc. Russia was technologically-backwards and no threat to the world. Also, Our Lady of Fatima accurately predicted the name of the pope who would reign during World War II if God’s conditions for peace were not met. In addition, the Blessed Mother prophesied a strange and unknown light would appear in the sky signaling the next world war. This truly happened during the night of January 25, 1938 when a crimson (blood-red) light was seen all over Europe and documented in the media. Secondly, on the last day of the apparitions, October 13, 1917, a spectacular Miracle of the Sun was performed before 70,000 people. It was written up in all the secular newspapers at the time in Portugal, and was even mentioned abroad in the New York Post, etc. It even converted all the atheists that day who witnessed it. Alright, maybe you need more convincing… How about Our Lady of Zeitoun, Egypt? Over 40 million people–including Jews, Christians, and Muslims, saw luminous apparitions of the Blessed Virgin Mary over the course of three years above a Coptic church at night during the 1960s. There are many videos of this event taking place in the Muslim world. Alright, perhaps, you desire a more “current” miracle to be convinced that God exists and especially, that we are in the End Times. Well, how about a live video clip of the Fourth Horseman of the Apocalypse? It was first shown on EuroNews, then picked up by MSN News and CNN. Millions of people saw a green spirit (ghost) on live video, although the news reporters did not realize what they were broadcasting when it happened. Here is a blog post along with the video and some related messages from Heaven. 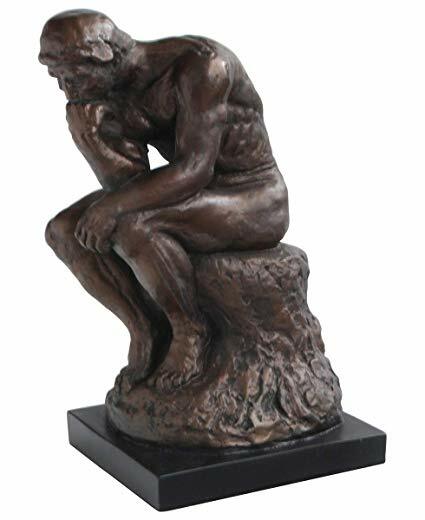 I know that as an atheist, it is hard to believe that God is real, because there is so much such “intellectualism” in the world that tries to prove otherwise. So, I will end with this video clip that is also challenging to refute. It is about the odds of the universe coming together by chance. God bless! I therefore, a prisoner for the Lord, beg you to walk in a manner worthy of the calling to which you have been called, with all lowliness and meekness, with patience, forbearing one another in love, eager to maintain the unity of the Spirit in the bond of peace. Thanks to a suggestion by blog follower “J”, I created a new webpage with all the PDF document downloads found on this blog, MaryRefugeOfHolyLove. So, if there is a particular writing of mine that you want to save for the future, or collection of heavenly messages that you are interested in, they can be found on this new webpage. I am actually very happy that I completed this task, as it will enable me to “clean up” some of my other current webpages in preparation for the Great Warning (Illumination of Conscience) with more text information and less links. Also, it became even more clear to me my own mission before God, as I realized more profoundly a few things. Firstly, I realized even more how vast and comprehensive Our Lady’s Plans are for this End Times and saving the entire world. There are so many people involved. The planning and organizing by Heaven for all these various helpers and chosen messengers on earth have been such a massive undertaking–perhaps, spanning the centuries, to bring about the circumstances and all the various people who would contribute a crucial part in Our Lady’s Plans. As I have written before, it is important not to compare different prophecies between different chosen messengers, because each one has a different role and mission given to them by Heaven. This is because as the Holy Bible counsels, prophecy is imperfect. Instead, it is critical to use one’s discernment of spirits to test the messages primarily by looking at teachings and lessons that are given and whether they are compatible with the Catholic faith, etc. And yet, I have realized over time that my own role–my own mission–has involved reconciling the many heavenly messages given today to various chosen souls. This I have done in my various writings and commentaries which many of you have read. I think that this has been because there has to be a coming together of all the various parts to make a complete whole in Our Lady’s Plans in this End Times. Otherwise, there would be all these fragmented parts all over the place and no one would understand what needs to take place to bring about peace in the world at the time of the Great Warning. So someone or something has to tie everything together, which has been my mission as I have discerned it. I do not consider myself to be any particularly special person to have this mission. To be honest, although I write about my understanding of various heavenly messages from different chosen souls, I do not consider myself to be an expert in any particular body of messages. It is actually my understanding that every person is vital to the Plans of Our Lady–no one person is more important than another as all are needed for the success of Our Lady’s Plans. For example, many people are experts in a particular area of the Catholic faith. We have people that are experts in Fatima only, or Garabandal only, or Medjugorje only, etc. We also have many people that are experts in teaching the Catholic faith–such as the many apologists (many of them converted Protestants acting as a “bridge” to our separated Christian brothers and sisters), many catechists, and lay apostolates, etc. We also have the experts in the ways of the Holy Spirit such as the Catholic charismatics and those who are familiar with the workings of the demonic and deliverance ministries, etc. All of these people are vitally important to Our Lady’s Plans for their knowledge in their area of expertise. Shockingly, I, “a soul,” do not know everything. Okay, I am smiling here, but I am also being quite serious. I just think that when the Great Warning happens, everyone who knows anything about the Catholic faith will be mobilized and suddenly, Our Lady’s Army will appear. Everyone in all their own areas of expertise will be needed to educate and instruct the masses of people who will be needing help in the aftermath. Everyone will want to know about Fatima, Garabandal, and Medjugorje, as well as generally, about Marian apparitions, such as Holy Love Ministries, etc. Everyone will be hungering about the Catholic faith as many people will be baptized then, and will want to know how they can become a true child of God and grow in personal holiness. And certainly, as many people will possibly have a very bad, even “hellish,” experience during the Great Warning, these people will want to know about spiritual warfare and how they can save their souls from satan. So, everyone is important and every person is needed with the knowledge and talents that God has given them. You, my beloved followers, are very important to Our Lady’s Plans. Not only are you the exceptional prayer warriors so needed by Our Lady–helping the holy angels in their supernatural battles, but your roles are critical to the conversions of others in your own “sphere of influence.” Truly, there are some people in your lives who will only be converted and saved by you and your work and no one else. 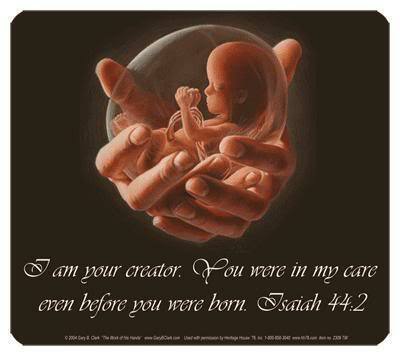 You are the “critical link” between them and God. 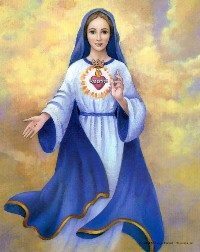 So, please know, even though I write and I have this blog for Our Lady, you are just as important as me, in spreading God’s Love to others and saving souls. Our Lord loves you and everything that you do for Him, especially, to help others. So, I hope that this writing helps you to recognize how special and dear you are to God and Our Lady and to appreciate your own talents and gifts and what you can offer to others, especially, when the Great Warning happens. Now, that being said, the new webpage containing all the PDF downloads on this blog, MaryRefugeOfHolyLove, is a resource for you to convert others, which I will regularly maintain. It has all my commentaries about understanding the Divine Plan, as well as all the heavenly messages that people will want to read in the aftermath of the Great Warning, etc. Of special note, I also have downloads available for the Baltimore Catechism–which is the simplest catechism available for teaching the Catholic faith to youths and adults, as well as the official Catholic Catechism under Pope John Paul II, and a copy of the Holy Bible (Doauy-Rheims version), which are nice to have. Also, there are some outside links with PDF downloads that people might want to consider having, especially, to help teach others the Catholic faith. For example, I have links to all the PDF materials available at Holy Love Ministries, etc. All of these downloads are important to have because there will be coming a time–I feel–when the internet will no longer be available. We also know that at the time of the reign of the antichrist that we should no longer look at anything online, because it will be demonically controlled. So, if there is anything that you would like to save for the future that is available online, I suggest that you start collecting it now to avoid the rush that will happen once the Great Warning happens. God is guaranteeing 40 days of peace in the aftermath, but after that, it all depends on free will whether good or evil will prevail. In the Book of Truth (Maria Divine Mercy), God has promised the salvation of at least 5 billion people, but that leaves 2 billion left unaccounted for who could potentially cause problems for the whole of mankind. So, if you value anything online, now is the time to collect it.